Archbishop John chaired an Interfaith Question Time at the Faraday Lecture Theatre Swansea University on November 14, 2018. There will now be four Interfaith Forums in Swansea, at various venues, every year. Ascension Day 2018, May 10, I went up a mountain that sometimes is said to be the highest point in mid Wales, Brynmawr. I was taken there by Pam Evans of Peace Mala to be introduced to a Buddhist monk. Here is the recording. I think Pam might have filmed us as we sat, Lama Rabsang in his meditation box, me cross-legged beside him. Choje Lama Rabsang was born in a village in eastern Tibet in 1971 and became a monk at the age of 11, initially studying under his uncle and completing his monastic education at Palpung Sherabling Monastery in the northern Indian state of Himachal Pradesh, which practices according to the Karma Kagyu lineage of Tibetan Buddhism. There, he studied under the guidance of Tai Situ Rinpoche and Mingyur Rinpoche, and following a three-year retreat, was appointed discipline master, remaining at the monastery for a further four years. 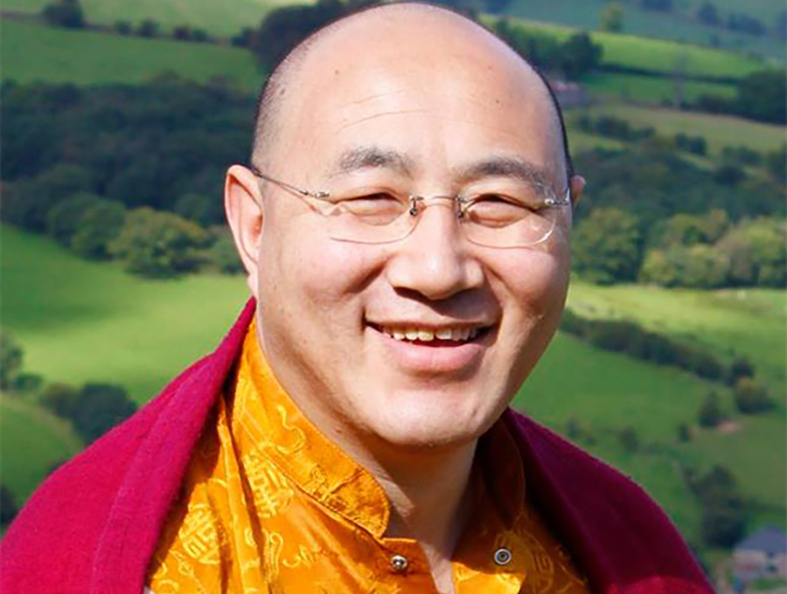 Lama Rabsang came to live in UK in 2001, was appointed teacher at Palpung Changchub Dargyeling in 2004 when the Dharma centre first opened in the town of Llandrindod Wells. In 2007, the centre moved to Cardiff, before purchasing the chapel in Brynmawr in 2009. Lama Rabsang told me that he came to Wales after some time in England because he was told that Wales is just like Tibet. He smiled like Buddha when I asked him if he had found this to be true. Erin Kavanagh is a daughter of Ireland, born on the border of North Wales, on land since reclaimed by the sea. Not sure whether to study in Oxford or Cambridge, she was guided instead to Lampeter University in the 1990s, “where the intellectual misfits have studied for the last 200 years or more”, and she hasn’t left yet. She is currently carrying out research into the land beneath the sea, where once animals and human beings moved on foot between Wales, Ireland and France, no doubt without consciousness of this country or that but instead in tune with land,sea and sky. Science and art, archaeology and philosophy intertwine, bend and move in Erin’s working life and in her spirituality. For Erin, all these are one; she dwells in the material and the spiritual at the same time, though time and space themselves bend and move too. Witch comes from withy, to bend and move like the willow tree. Erin works with and across lines and borders. A creature of liminality, her spiritual practice reflects this. From early childhood, Erin was aware of her own place and calling to the edges, to cross them and bend with them and to bring peace and gentleness to people. She has no desire or compulsion to convert anyone to or from anything. 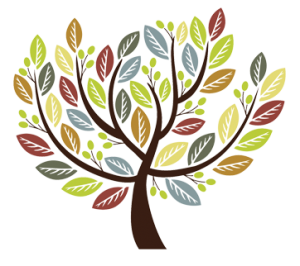 Liminality is by nature, for Erin, interfaith. She respects all authentic spiritual and religious paths. Catholic nuns taught Erin early in her life that spirituality is light. Jesus, whom she calls by his Aramaic name, Jeshua, is at the centre of everything, “It’s all about him.” Listen to this interview. May it challenge you and bring you peace. No Religion. Man of Faith. 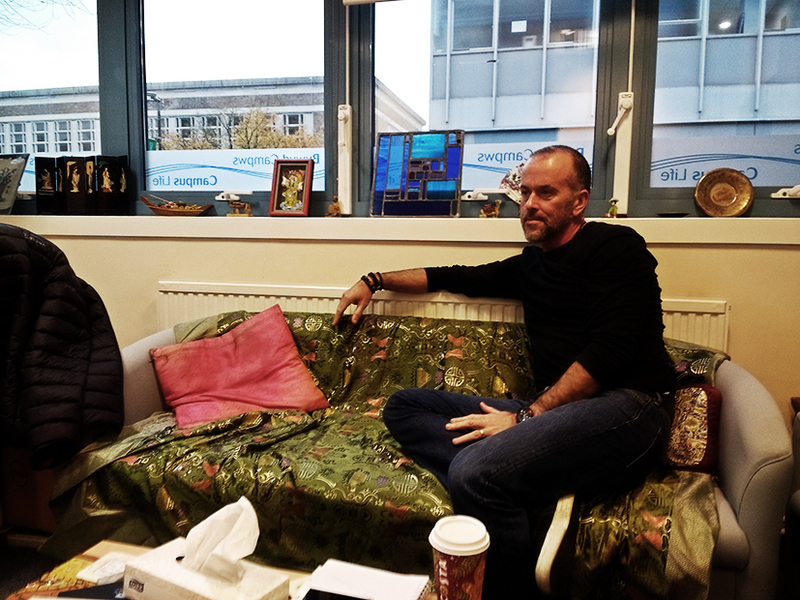 An Interview with Kev Child, Director of Student Services at Swansea University. Kev has no particular faith affiliation of his own but he is deeply engaged in interfaith dialogue and activity. His own spirituality is fed through his work with student welfare and through his experience of nature, yoga and surfing. “The sea is my church”, says Kev, and he will often spend 3 or 4 hours in contemplative communion with the waves, alone or with a few close friends. The surfing community don’t discuss their work or their worries when they’re out among the waves but rather they give thanks to the universe for their being together and for their simply being alive and present to the wave and the moment. Meanwhile, Kev has the deepest respect for the more traditional faith communities and the role of religion in people’s lives. 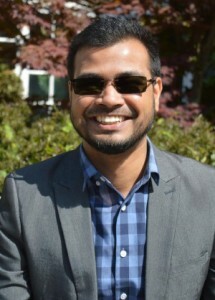 He believes that interfaith dialogue holds the key to community integration and wholeness. This interview was recorded in the Peace Garden at Peace Mala HQ in Morriston, on a windy Autumn morning in October 2017. 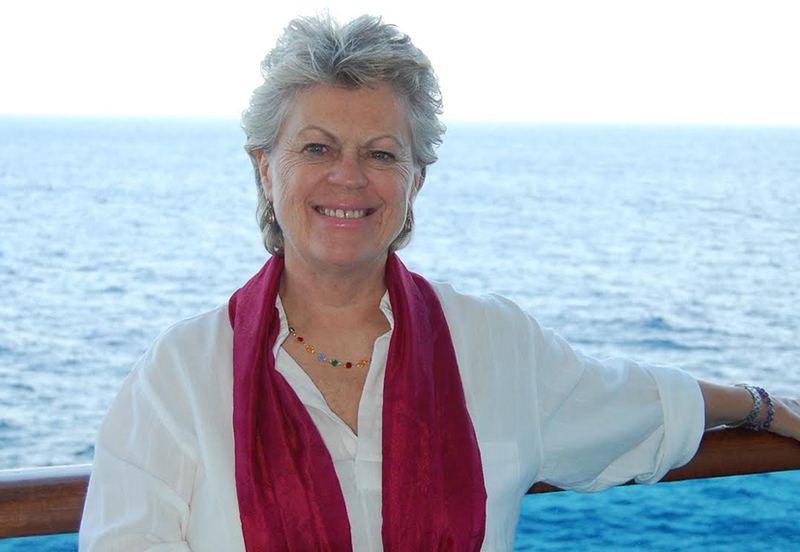 Pam Evans​, leader and founder of Peace Mala, speaks from the heart about the struggle for peace and the calling to all humanity, whatever faith or non faith a person feels affiliated to, to walk the earth with respect for one another and with gentleness, compassion, kindness and love. Love is what the cosmos is about and all authentic faith meets and transmits this. Organized religion must remember this and teach it. The calling of faith communities is to bring people to experience what is Real. Peace Mala is a world-wide organization and it has been endorsed by Archbishops, the Dalai Lama, Pope Francis and many more. 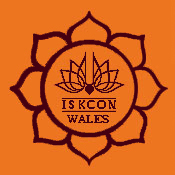 This is an interview with Danda-krt dasa recorded in the Hare Krishna temple at Govinda’s Vegetarian and Vegan Cafe in Swansea. Interfaith dialogue began between us even before we started speaking. 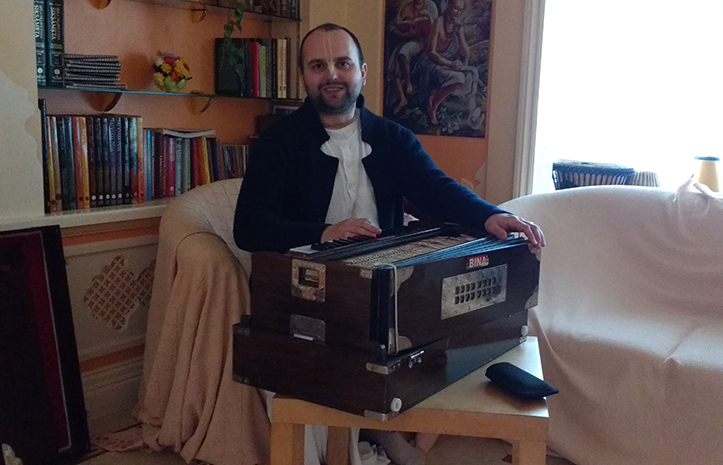 Danda sat next to his harmonium upstairs as we settled to record. I had an Irish flute with me. Neither of us thought to ask, “What kind of music do you play?” or even, “What key shall we play in”. The music simply started and, prayerfully, we found the dialogue had begun. The interview came naturally when the music gave way to words. Listen to the music and then listen to Danda speaking about God and about living, praying and doing in the flow of God consciousness. Such is the essence of Hare Krishna. You will find out about the movement’s beginnings, its founding in the West by His Divine Grace A.C. Bhaktivedanta Swami Prabhupada, and you can enter quite deeply, through Danda’s guidance, into what the faith is all about. 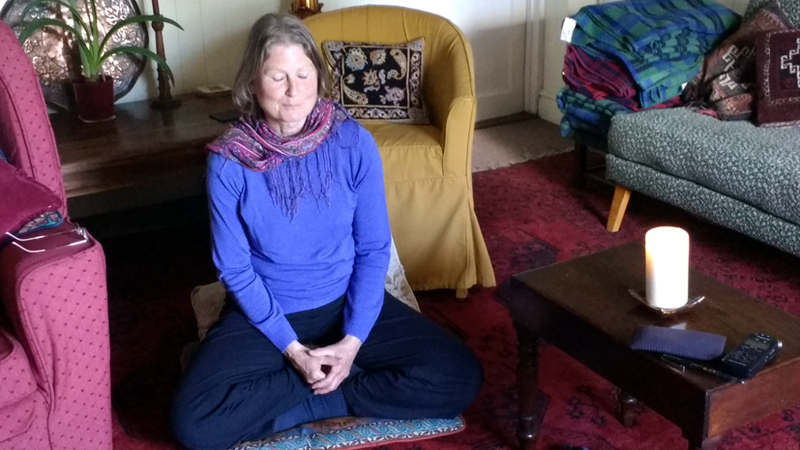 This interview with Nur Jamil took place at the Centre for Meditation, Healing and Retreat, which she runs at Dre Isaf, Ystrad Meirig in Ceredigion. Nur Jamil is of the Sufi order set up in Britain by the Indian Sufi master, Hazeat Inayat Khan (1882 – 1926) who came here after the First World War. Nur Jamil says her spiritual path intertwines Christian and Moslem roots but also that contemplative practice takes us deeper than religion. If you listen to her you will realise that Christ is central to the way in which Nur Jamil interprets the spiritual journey of the human adventure into purity (sufi), as we traval into and from divine consciousness and being. Listen too for some wonderful illustrations, not least concerning the poet Rumi, and beautiful Sufi prayers and blessings. This is an interview at the Mosque at Swansea University with Dr Mahaboob Basha in late March 2017. I also met Sheik Mohsen El-Beltagi, the Imam in Swansea and was made very welcome. I shall gladly accept the offer to attend the Mosque sometimes for Friday Prayers. Islam is a “message of peace”, says Mahaboob, “a message of peace and love”. Sheik Mohsen and Mahaboob are both active in interfaith dialogue and believe that deep listening and sharing of faith will help societies in the world to integrate with compassion and respect for the other. “When integration happens, really integration, then there is community and I think there can then be no problems in society” – Mahaboob. For me, the reporting of Islam in the media these days is almost always uninformed, distorted and deeply destructive. I look forward to working with Mahaboob and Mohsen in the cause of peace now and through years to come. 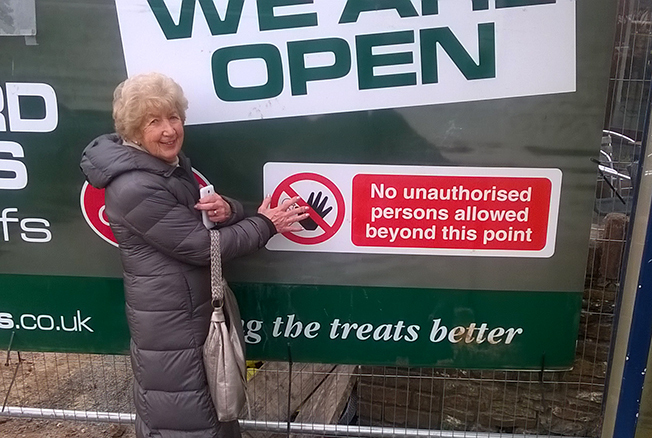 Here is an interview with Norma Glass MBE about the Jewish community in South Wales. It was recorded in a Gower cafe on the cliffs, in late January 2017. Norma is the Welsh representative on the UK Board of Deputies of British Jews and is a founder director of Peacemala UK, a member of SACRE, a former president of Soroptomist International and a board member of the South Wales Police Independent Advisory Group. Norma is chair of the Older Minority Ethnic Network run by Age Cymru and was awarded an MBE by the Queen for Services to Racial Understanding in Wales. In 2010, she was honoured by First Minister Carwyn Jones AM for her contributions to Race Relations. 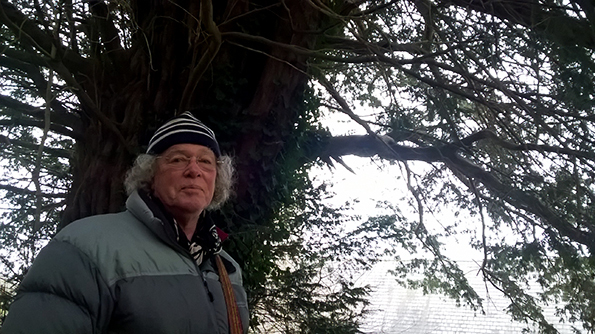 This interview with Druid Dr Ian Clegg was recorded under the ancient Yew tree in the llan of St Rhydian, in which Llanrhidian church is built. The interview took place in January 2017. A raven, a druidic symbol of peace, wisdom and divine communication, can be heard toward the end of the interview. 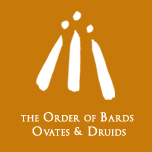 Dr Clegg is a Druid and member of OBOD (Order of Bards, Ovates and Druids) and he is active throuout the UK and in Brittany. Of Scottish origin, Dr Clegg is currently based in Gower. Much of his life has been as an academic (history, philosophy, politics) and a political activist. Olivia is a Priestess of the Fellowship of Isis and Glastonbury Goddess Temple. She is an active member of the Pagan community, and also engages in many interfaith activities throughout the year, seeing God as present in all faiths. From early adolescence, Olivia felt a calling to become religious clergy, and at the early age of 21, in 2013, Olivia dedicated as a Priestess of the Fellowship of Isis. 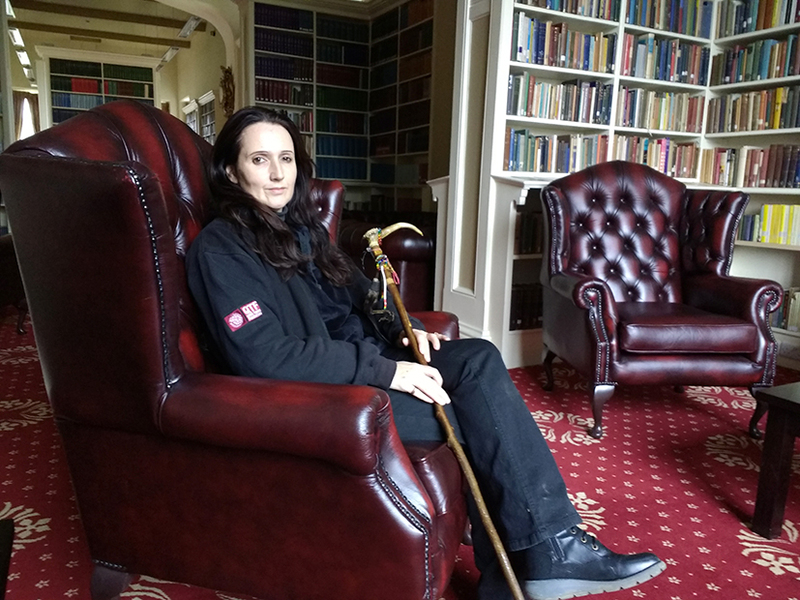 In 2018 she went on to complete further Priestess training in Glastonbury and (re-)dedicated as a Priestess of the Goddess. Olivia studied Egyptology at University and in the near future plans to continue this with PhD study in Egyptology or Anthropology. Ancient Egypt fascinated Olivia from a young age to such an extent that she decided to devote her life to studying and writing about it. The religion of the ancient Egyptians inspired Olivia, who found that it resonated with her own spiritual view of the world more closely than other ‘living’ religions today. Olivia believes that there is Divine truth in all spiritual paths, and ultimately believes in the universality of God-Goddess-the Divine, manifest in nature and all of creation. Interfaith dialogue is not about telling everyone how great our angle on faith is and trying to convert them to it. It is about respect and openness. Religious doctrine is expression through language, symbol and concept of something indescribable and un-namable. It is telling, for me, that when Moses asked God, who had appeared to him in a burning bush in the wilderness, "What's your name", God replied "I am who I am...Now go and tell the Israelites I am sent you" (Exodus Chapter 3). In fact the translation doesn't carry the full meaning of even the Hebrew, let alone the full essence of the utterance itself. When we talk of God and faith, we speak of Mystery, and we do so in language that can never transport the reality of that to which we seek to refer. Much fighting and squabbling in the world is attributed to the clashes between religious people who think they have the one true faith and who think that all the world should think about and relate to God, life and the universe within their particular structures of belief. I am not interested in any trivial shows of ecumenism. 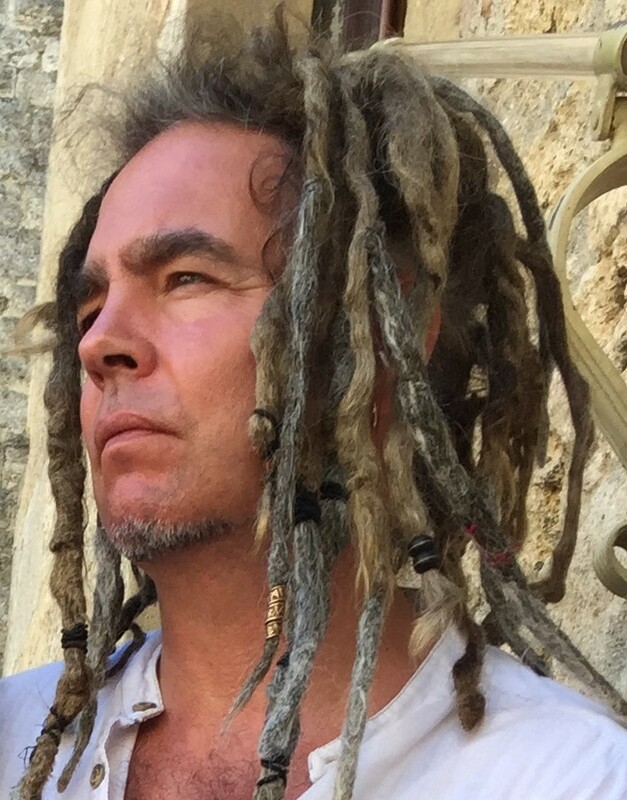 I am interested in sharing spiritual practice and positive dialogue, through which people of diverse cultural, religious, political and philosophical background may learn of each other's authentic journeys through time and space. I have rarely, if ever, met a person who, at the deeper levels, beneath the surface lenses of their programmed mind, does not love the message of Jesus Christ. 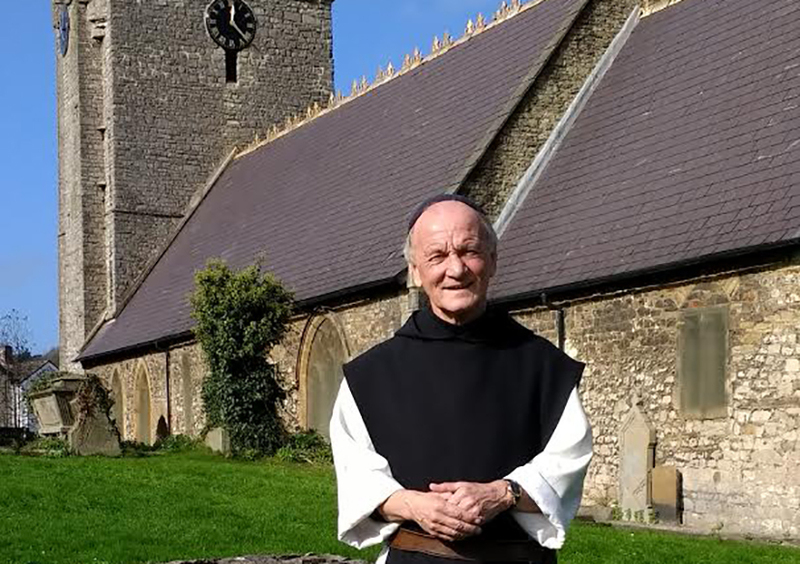 I have met of course very many who, often with reasons I empathise with, absoulutely abhor the church (at least the post second or third century versions of the church). Honest and respectful interfaith dialogue is the only way to heal the rift between perception of Christ and perception of church. So I try to walk in the integrity of my calling to Christian priesthood, seeking, through Christ, authenticity in how that might be expressed and lived out. Meanwhile, I want to look into the hearts of my sisters and brothers of differing spiritual understanding and share with them also what is in mine. If people of faith, or those without conscious faith for that matter, take the time to listen deeply to eachother, then faith may yet have something earthshakingly of value to say to the world. Christ reveals I am who I am to, in, through and for all creation, not just for those who say the 'right' creeds and sing the 'right' songs. There is a wonderful opportunity to find out so much more than we think we know through interfaith dialogue! I hope that you will find some of this dialogue on this page and that you will be stirred to join in with it.